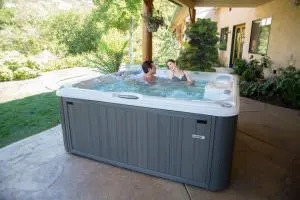 Sundance Spas has been manufacturing hot tubs since 1979. They are based out of California, and their products are sold in more than 60 countries. Sundance Spas focuses on creating acrylic spas, and they are rated as the top worldwide distributor and manufacturer of this particular style. They also produce in-ground and portable hot tub models. This award-winning company has developed their products with the benefits of hydrotherapy in mind. They also offer a complete outdoor room approach that includes wall décor, floor coverings, accessories, furnishings and lighting. Sundance Spas has earned an A+ rating with the Better Business Bureau, and they produce energy efficient hot tubs. If you are needing a replacement hot tub cover for your Sundance Spa The Cover Guy is your answer. With all Sundance Models on file The Cover Guy can easily provide you with a new hot tub cover without you having to measure. The Cover Guy Sundance Replacement covers are the best made covers at the best price available. Your new hot tub cover will be delivered promptly right to your door. Indicates a hot tub power failure. The power is fluctuating in the 2ndary power line resulting in low DC voltage. Attempt to rest the spa power, The PF error will reset itself if power levels return to normal. Contact the dealer or service technician if the problem continues.